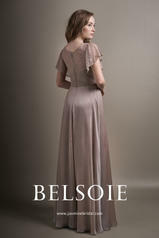 V-neck dress in Belsoie Tiffany Chiffon with a lace bodice and ruching at the waist and top of the skirt. An elegant dress with lovely lace, butterfly sleeves. A romantic dress featured in the color taupe.